Darice had her first tooth fall out!!! Well, not fall out, more of pulled out. I woke up Saturday morning with Darice doing her whiny cries and it was because her loose tooth was well, looser already. I looked at it and it seems that was only hanging by a (gum) thread. It was also starting to bleed, so I knew I had to act fast (she might whine louder when she sees the blood kasi). I asked Dar to get some ice, so I can rub it on Darice's gum, to at least numb the gum area. After rubbing the ice on her gums for a few minutes, I grabbed the face towel, used it as a "glove" to hold Darice's loose tooth, and as my daughter shook in fear (and pain?) pulled out the tooth, in one smooth yet nerve-wracking motion. She cried a bit, and her gums bled a bit too so I asked her to gargle. I asked her to bit on a cotton ball while Dar prepared her frozen delight. She absolutely loves the new Chuckie Choco Burst, and we store it inside the freezer, so Dar took one out, poured the frozen choco slush in a glass, and viola, Darice was smiling again! Minus one tooth. Hehe. Now I'm waiting for her other upper front tooth to fall off :) Hehehe. Finally got to watch Borat: Cultural Learnings of America for Make Benefit Glorious Nation of Kazakhstan after some prodding from Ton and validation from Pajiba. If you're not easily offended and if you totally get the point of this movie, then go ahead and watch it. Dar, Darice and I had lunch at my Mom's house the next day, Sunday. After eating, I went upstairs with Darice while Dar tried to diagnose their PC. Then, my mom asked Dar and I to go downstairs to their room -- usap daw kami. Anyways, my mom and dad just wanted to talk to us because they felt that Dar wasn't that comfortable yet with them (he still called them daw Tito and Tita eh dapat Daddy and Mommy na :P) because of "our history" -- syempre mejo telenovela nga kasi ang boyfriend - girlfriend past namin ni Dar. As my mom said, "turbulent" nga daw kasi relationship namin. Even though before pa, when I introduced Dar to them, they said that "buti naman improvement of the race" [ganyan talaga mommy ko, pagpasensyahan nyo na sya, she called one of my sister's ex halimaw coz he was ahm panget :P] -- hahaha, I mentioned nga na I would tell Dar na I never heard mom say anything about how he looks. And then Mom told us that my grandfather thought that Dar "had manners" and generally he was a good person. And they just tried to discourage us from the relationship because we were still studying and they could see nga na that the relationship was going out of bounds -- to no avail, nangyari pa rin yung iniiwasan nilang mangyari hehe. Kasi daw, baka Dar was comparing himself to my sister's BF right now, na magmumukhang mas tanggap nila, pero it's because my sister daw kasi and her BF are working na, so whatever happens to them, they can, at least, support themselves na. Unlike us daw noon, we were still studying. Sakto naman, because when we were "discussing" our future, Dar said he'd have a hard time getting me back if I went back to my parents. He said it took him a long and hard time just to get Darice and I -- and he was making tampo nga na parang mas maganda ang trato nila dun sa BF ng sister ko. Well, anyways, now Dar knows na he was able to charm my mom (sabi kasi nya mommy ko lang daw ang hindi pumalag sa charms nya) kahit onti, and that it wasn't him really, my parents was just uber-protective of me. And then on our way home, we got hit by a trike. Good thing Dar wasn't a hot head that afternoon. 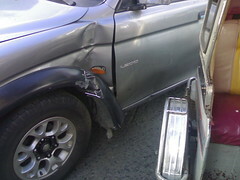 Maybe because Darice was with us, and we weren't really that familiar with the area where we got hit. Basically it was an intersection, and the trike didn't (wasn't?) able to stop as we both approached yung gitna. Well, I would expect the trike to stop kasi nauna na kami dun sa intersection. Another reason why I hate driving. Tsk tsk tsk. So that's it for my eventful weekend. This weekend is a loooooooooooong weekend, and I'm planning to do my Christmas shopping already -- I'm hoping to get our 13th month pay on Thursday, woohoo! Cheerful na'ko noh? :P Hehehe.